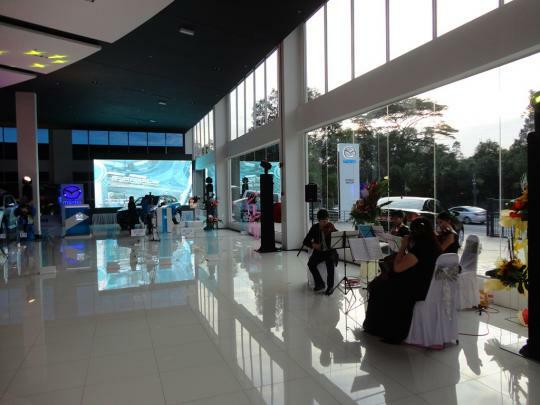 I recently attended Mazda's largest showroom in Southeast Asia launch in Glenmarie, Shah Alam over at Malaysia. An impressive building that consists of two levels of car display, a workshop and office space sprawled over four floors totaling 130,000 square feet. 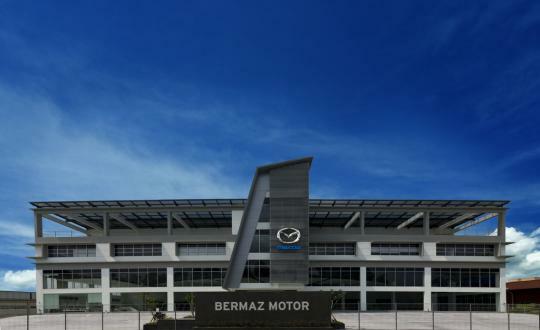 This shows commitment from Mazda's local partners Bermaz Motor Sdn Bhd as well as Mazda's commitment in the region. Anyway, aside from the free flow of food as well as feasting on the eye candy present, I was there to see what's new with the Zoom Zoom brand. 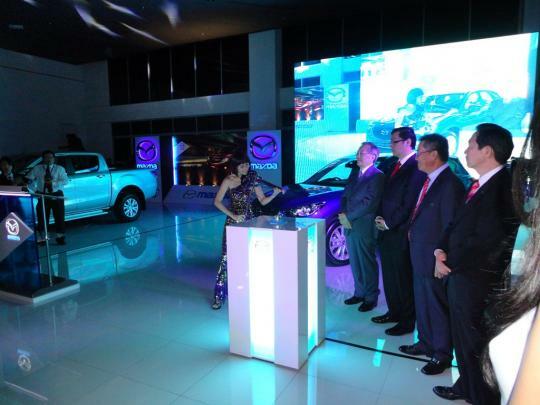 This was actually quite easy to do as the President/CEO of Mazda himself was present for the launch. 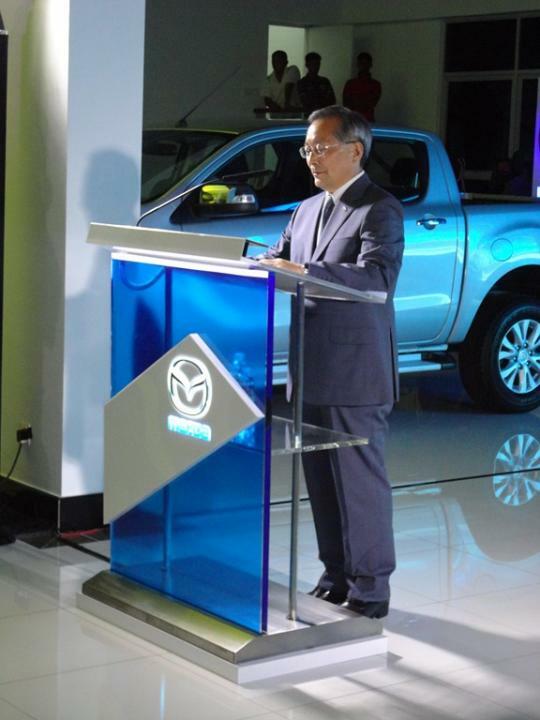 Mr Takeshi Yamanouchi (pictured below), the President and CEO of Mazda Corporation had flown in from Japan to launch the multi-million Ringgit facility. He mentioned in his opening that whilst Mazda had suffered from long economic slump in U.S. and Europe and the very strong Yen, they are now aimed at turning around their business by achieving 1.7 million global sales and operating profits 150 billion Yen by 2016. They have also targeted a sales total of around 150,000 units, triple the current sales volume for ASEAN market by 2015. Then later at the press conference he went on the ask questions from the floor and we get to hear what he has in store for Mazda in the near future. Firstly, Mazda is totally putting their weight behind their SkyActiv technology that is now being seen in the latest Mazda CX-5. In an era where other car manufacturers are building hybrids, Mazda feels that they basically needed to focus on the basics � the engine, transmission, body and chassis for greater efficiency overall. A highly efficient engine and transmission, lightweight chassis and an aerodynamic body that would work together would make a conventional, non-hybrid or fuel cell car work just as well. I suppose this makes more sense as hybrids add heavy battery cells to cars which usually have a whole lot of toxic chemicals in them or during its manufacturing processes. The reason why Mazda does not pursue fuel cell technology at the moment is the fact that these are still too expensive to produce for the mass market. And as Mazda isn't a giant like Toyota or even Honda, it makes even more sense to be lean and mean as well as making the best of what they have. Secondly, when asked whether there was an RX-8 replacement, Mr Yamanouchi wasn't giving out any company secrets. He only mentioned that there were coupes in the pipeline with Mazda planning to launch 8 cars in the next five years. I suppose the first sports car that Mazda will launch is the MX-5 roadster which you readers know isn't powered by a rotary engine but a conventional, but SkyActive(d) car. I suppose the rotary engine is still too much of a gas guzzler to be part of Mazda's global line-up at the moment. But we can only hope. Lastly, I personally asked whether Mazda will make regional, affordable cars like the Toyota Vios, Honda City or cars like the China market Peugeot 207 and 408 sedan so that they can increase market share or be affordable to lower income earners. Mr Yamanouchi answered that for the moment Mazda has no intention of following that route and will concentrate on building quality cars and building on its current line-up. 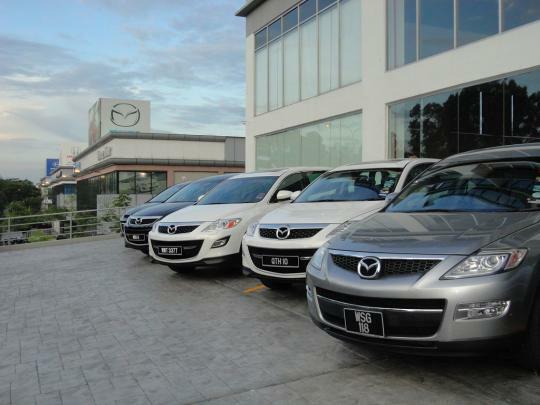 Mazda intends to increase market share by giving quality and the Mazda experience to everyone. 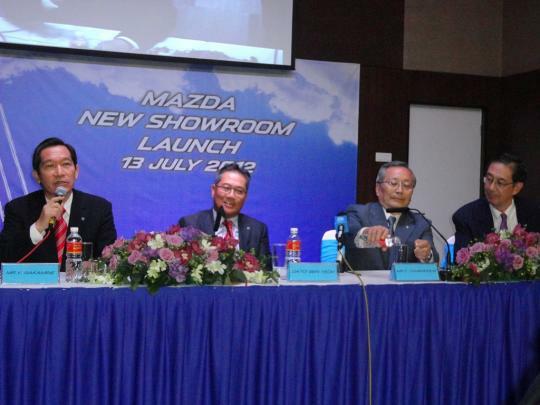 It's great to hear that whilst some companies and people only care about dollars and cents, Mazda intends to stay true. And oh, the food and eye candy was good too. I said that earlier didn't I? Born in 1972. Married with a kid. Loves B-road drives and have driven cars from the 1950s to date.